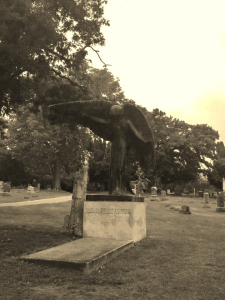 There is this thing that I have for graveyards; I like them, a lot. As someone who loves history and most especially family history, I find them peaceful and interesting. I am also superstitious. Once, I have had a black cat cross my path and admittedly did not walk in a circle 13 times, walk backwards over the place that it happened while chanting bible verses, because I did not want to look unusual, but then bad things happened, three of them including a bad fall off of my bike and an incident with the garage door and a truck. And this is why it took me so long to cross this “Odd things in Iowa” and “Weird US” destination off of my Iowa bucket list. Well that and I don’t live in Iowa anymore.